Often called Holland blinds, roller blinds offer a simple, neat and effective way to provide light control and privacy. Material options including total light block out, light filtering and mesh make roller blinds very versatile and able to be tailored to suit individual needs. Fixtures and fittings are also colour co-ordinated to suit the material and décor of the house. Kawana Blinds uses quality components from established Australian suppliers and maintains a stock of components in its factory. This system allows you to enjoy the view or filter light during the day and provide total privacy of a night by having dual roller blinds fitted to a window. A specially designed dual bracket that holds both blinds is fitted to the window reveal or frame. 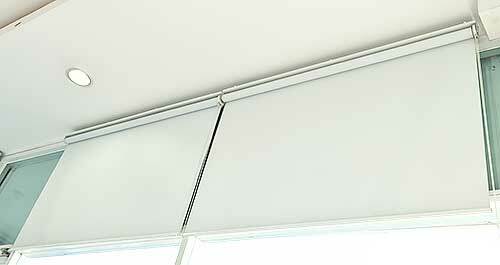 Roller Blinds can be supplied with either precision manual chain control or motorised. Motorisation can be permanently wired to the household supply or battery operated. Motion control can be via fixed switch or remote control. Multiple motorised blinds can be controlled through a single controller. With advancements in technology we can provide and install sensors that can sense heat and light and operate the blind to maintain a comfortable environment and to lower energy costs.